Yes I know Christmas is still a few weeks away, but Stir-up-Sunday is fast approaching. It falls on the Sunday before Advent which is the 22nd November this year. It’s traditionally the day when the Christmas puddings and cakes are made and when the family all take a turn at stirring, not forgetting to make that all important wish whilst they’re at it. So to get you in the mood and to offer a little inspiration for your Christmas baking, I made this fig almond cake yesterday with a very cheeky slug or three of whisky – Whisky Galore. Last year I made this fig and mincemeat cake for Christmas and it was so delicious that when Waitrose challenged me to make a Christmas cake with a twist this year, I knew immediately I wanted to make one with figs and almonds as the principle flavourings. My aunt, who lives in Spain, sends me a pan de figos for Christmas every year. I love this pressed fig and almond wheel, which is delicious on its own or with a slice of Manchego, or any other cheese for that matter. These traditional Mediterranean ingredients go together very well and are often combined with honey. The bees can buzz off this time though as I wanted to use a British tipple instead. CT recently returned from Scotland but for some unknown reason, he forgot to bring any whisky back with him. Luckily a trip to our local Waitrose sorted out the water of life deficiency – important, as I wanted it for my fig almond cake. As always with my bakes, I like to make them as healthy as possible. This one uses wholemeal flour with real butter and muscovado sugar. The figs, almonds and eggs are all nutrient rich and the whisky? Hey, it’s Christmas. I made six cheeky mini fig almond cake bundts with a little of the mixture, so that I could try one straight away. It was even more delicious than I thought it would be: moist, slightly sticky and with an occasional crunch from the almonds. This delicious light Christmas or New Year fruit cake is made with almonds and figs soaked in a cheeky dram or three of whisky. It can be baked a few days before needed or right at the last minute. Soak the figs with the whisky in a covered bowl overnight - even a couple of hours will help. Sift in the flour, almonds, baking powder, bicarb and spices. Stir until just combined. Grate in the orange zest and stir in together with the orange juice. Add the figs and whisky and stir until just combined. Oil a large bundt type mould or tin, then place a few almonds on the base - when turned out, these will be on the top. Spoon the batter on top. Bake at 180°C for about 45 minutes or until the cake is well risen and an inserted skewer comes out clean. Allow to cool for 15 minutes, then turn out onto a wire rack to cool completely. Mix the icing sugar with the whisky and just enough water to make a slightly runny icing. Drizle this over the cooled cake. For best results, overnight soaking is also needed. Can bake in a deep 8" tin instead of a bundt type mould. You can easily hive off 6 tbsp of mixture and bake them in muffin tins to create 6 mini Christmas cakes. I’m sending this recipe off to Love Cake with JibberJabberUK. The theme is Best of British and although the inspiration for this fig almond cake came from the Mediterranean, nothing is more British than a fruity Christmas cake, especially when it has as much whisky in as this one does. Having made some mini bundt cakes from the recipe, I am joining in with Cook Once Eat Twice over at Searching for Spice. 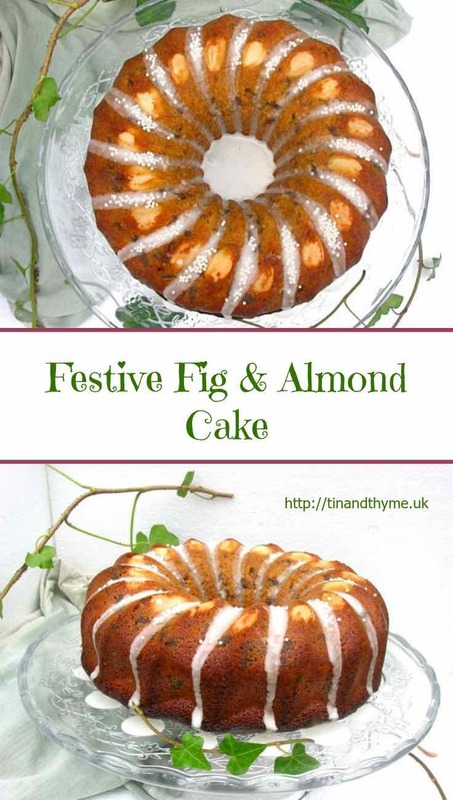 As I mentioned earlier getting a fig and almond wheel for Christmas has become a bit of a family tradition, so I hope that’s not too tenuous a link for this month’s Inheritance Recipes which is Festive Foods. This is hosted alternately by Coffee & Vanilla and Pebble Soup. And my figgy almond whisky cake also goes to Kerry Cooks for Christmas Cake Club. Thanks for visiting Tin and Thyme. If you make this fig almond cake, I’d love to hear about it in the comments below or via social media. Do share photos on social media too and use the hashtag #tinandthyme, so I can spot them. For more delicious and nutritious recipes, follow me on Twitter, Facebook, Instagram or Pinterest. Fig Almond Cake. PIN IT. It’s a difficult one. Christmas is all about tradition, on the other hand, it’s always good to bring in a surprise element. This sounds delicious! It almost makes me wish I needed to bake a Christmas cake myself, but my family don’t really like fruit cakes, even light ones like this. If I didn’t make a chocolate or ginger cake at Christmas there would be uproar! Haha Suelle, you’ve got to keep the family happy, especially at Christmas. But you could always quarter the recipe and make yourself a small one, or even a few mini ones for the freezer. This looks so Christmassy and much less faff than a traditional Christmas cake! Thanks Sarah. Less faff and tastier too, I reckon. wow your bundt cake looks phenomenal! It pains be that its November and we are all talking about Christmas – but hey, I better get used to it. This looks like a delicious cake and I adore dried figs and the flavour they give – brilliantly different christmas cake recipe! Ah I feel your pain Ceri, but gone are the days when I adamantly refused to mention the C word before December! I love figs too and it’s nice to have a cake where they are the main event. Yes, thanks Lucy. I was trying to get a bit of Christmas sparkle going, so I’m glad it worked. It looks stunning, a fantastic centrepiece and sounds like it might taste heavenly. What was CT thinking?He won’t return empty handed next time for fear of being named and shamed again. I’m hoping to make some mini bundt Christmas cakes now I have the right pan, love almonds so this one is right up my street. Thanks Janice. It took me ages to find a mini bundt mould, but I’m so glad I did. They make pretty much any cake look so cute. You can’t have too many Christmas cake recipes. I love figs, and almonds! This cake looks delicious, I may just leave the recipe conveniently around my mums kitchen as a little hint for xmas baking! Love how you’ve done the icing on this cake. Christmas cake. If I make it now would it keep or could I freeze it? I’m not sure how long it would last Gill, definitely a week and probably two. I’ve not tried freezing it, but cake usually works well in the freezer, so I don’t see why this wouldn’t. This cake looks good! I have never made a proper Christmas cake like yours. In Italy we always have panettone or pandoro but I am also very fond of the British rich Christmas cakes. Figs and almonds… sound like a heavely combination! that really does look like a lovely cake… i’ve just been developing a chocolate carrot cake for an alternative christmas cake but your bundt could also easily be a great alternative and has all those healthy wholemeal ingredients too! Divine stuff! I can smell it now with all the spices and dried fruit in it. I’ve left my Christmas cake with my father so he can feed it with his malt whisky! I always love the shape of a Bundt cake as gives a natural elegance. Thanks Ness. I’m a recent convert to whisky in cakes and now I think it’s the best. I’m also a big fan of bundt type cakes as they need little if anything in the way of decoration. Not sure I can think about Christmas just yet, but the cake looks beautiful and very seasonal (and the flavours are wonderful!). The mini bunts are so cute! Thanks Kate. Luckily, you still have a few weeks to go. Have to say this is the only Christmas ‘thinking’ I’ve done so far. That looks just wonderful Choclette! What a beautiful looking cake. It sounds delicious. Never too early for Christmas recipes Choclette – especially ones that contain booze! Gorgeous! Thank you for entering it into Cake Club! From above it almost looks like stripes of silver and gold – very festive! This looks like a cake I need to make. Love the inclusion of whisky as well as the figs. Whisky seems to work really well in fruit cakes I’ve found and figs are wonderfully festive as well as delicious.